Floods wreak havoc in Assam every year, and this year has been no different. Over the years, AJMAL FOUNDATION has been identified as the most trusted and sincere friend of those battered by the onslaught of natural furies like devastating flood, cyclone and manmade disasters. Already some millions of people have been assisted so far at the time of various catastrophes including earthquake in Nepal and Gujarat, tsunami in South India, flood in Bihar, Assam and West Bengal, cyclone in Odisha and the ethnic riots in Muzaffargarh (UP) and Assam. This year, floods caused by heavy spells of rain since the beginning of June have claimed 23 lives so far (courtesy: The First Post, dated- 21st June, 2018) . The situation in the State is far from improved and the damage to life and property has been enormous. There are thousands of people who, having lost their homes, are still living in relief camps. In Assam, over 5.48 lakh people have been affected in the deluge across six districts. 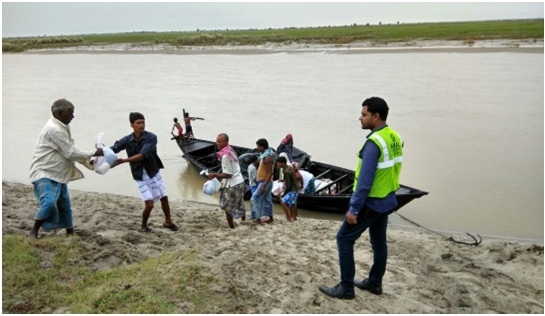 A total number of 719 villages under 20 revenue circles have been affected According to the Assam State Disaster Management Authority (ASDMA), the places that have been most affected are in the places of Nagaon, Hojai, Karbi Anglong West, Golaghat, Karimganj, Hailakandi, and Cachar districts. The district of Karimganj has been the worst-hit with nearly 2.15 lakh people affected followed by Hailakandi where over 1.93 lakh people have been suffering in the deluge. In the 225 relief camps of Cachar, Hailakandi and Karimganj, around 159652 flood-hit people are taking shelter (courtesy: The Assam Tribune , dated- 21st June, 2018). Over 5.48 lakh people being affected in the deluge across six districts. People have lost their homes and other aspects like cattle, farms etc and are living in temporary shelters; yet to be rehabilitated. Women and children are the worst affected. Without any shelter, the children suffer the risk of malnutrition and other diseases. Like every other emergency, the immediate requirements are food, cloth and shelter. We plan to reach out to the affected masses who will benefit directly and many more indirectly across the flood affected region. Mobilizing man power and material resources, the project will be accomplished in coordination with the local authorities.Locations will be selected keeping in view the severity of the calamity in the area and the people affected. Apart from this, the people affected in the last floods, who were still residing in temporary sheds, will be taken into consideration too. It will also include the people who are staying in relief camps after being forcibly evacuated by the Government agencies from their native places. While selecting the beneficiaries, the relief team will chose the flood affected victims considering their degree of devastation caused by the flood. People below the poverty line (BPL), physically challenged, orphans and widows will be given first preference. Once the beneficiaries are selected, tokens will be given prior to the distribution programs in order to conduct it without any hassles. The quotations obtained from different vendors will be analyzed and a comparative statement will be prepared for most cost effective and qualitative purchase. The organizing committee will organize the distribution program in a suitable location.Our team will implement the project with full fervour and proper planning and execution. We will provide food packets and clothes to the flood affected victims who are in deplorable conditions. The food packets will contain rice, pulses, flatted rice, sugar, salt, tea, baby food (Marigold), milk powder and grams. Clothes like lungis and sarees will be distributed among the deserving families. In the past, several projects have been done by AJMAL FOUNDATION regarding the relief and rehabilitation of flood victims throughout the country. In 2017, seven thousand and five hundred victims in Bihar benefitted from our project and five thousand in West Bengal. Similarly sixty Low Cost Houses were built for the victims of the flood that occurred in Chennai in the year 2016.